DECIDING FACTORS MMS AUGUST 2018 26 mmsonline.com Data-Driven Manufacturing EXPERIENCE THE ECONOMY OF QUALITY Invest in world-class BIG KAISER Boring Tools to eliminate scrap, reduce cycle time and bore perfect holes every time. Tool Holders | Boring Tools | Cutting Tools | Workholding | Tool Measuring | bigkaiser.com BIG KAISER APP LEARN MORE AT: bigkaiser.com/bkapp Download on the GET IT ON SEE US AT IMTS 2018 — BOOTH #431610 or act on data? It is important to explore how the product fits into this flow. Putting new technology into this overarching context will help you assess its significance and determine your readiness to benefit from it. Perhaps the best place to start is a visit to the Emerging Technology Center (ETC) located in the North Building. As one of two ETCs at the show, this center focuses on industry's digital transformation. (The other ETC focuses on addi- tive manufacturing and is located in the West Building.) Among the Digital Transformation ETC's attractions is a display of a physically and digitally connected machine tool, robot arm and coordinate measuring machine. In addition to showing how data sharing creates a closed-loop system (for example, tool offsets applied by the machining center can be updated automatically to compensate for tool wear and maintain a close dimensional tolerance), the display highlights the practical aspects of using data in an exchangeable format to facilitate automation. In this case, the exchangeability format is MTConnect. 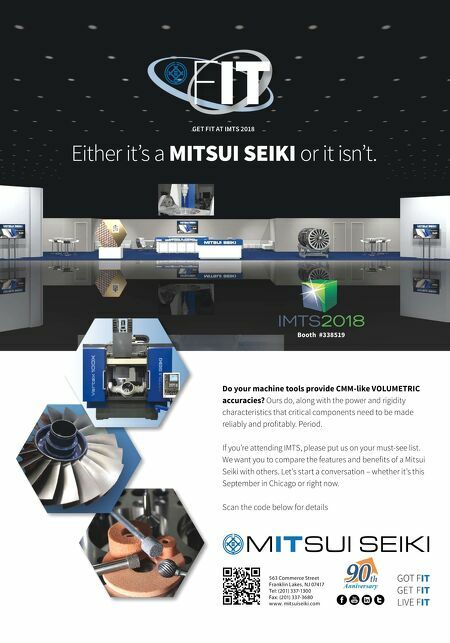 Significantly, IMTS 2018 marks the 10th anni- versary of MTConnect, a set of open, royalty-free standards that fosters greater interoperability between controls, devices and software applica- tions, which was launched at IMTS 2008. MTCon- nect will be prominent in other booths in which data from a variety of sources is being brought together for machine monitoring and other applica- tions. 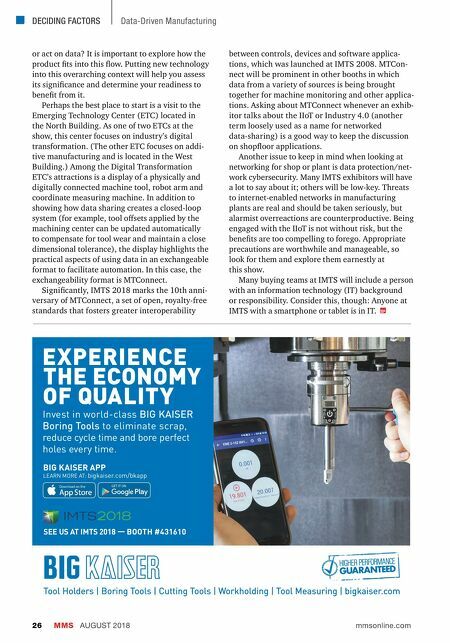 Asking about MTConnect whenever an exhib- itor talks about the IIoT or Industry 4.0 (another term loosely used as a name for networked data-sharing) is a good way to keep the discussion on shopfloor applications. Another issue to keep in mind when looking at networking for shop or plant is data protection/net- work cybersecurity. Many IMTS exhibitors will have a lot to say about it; others will be low-key. Threats to internet-enabled networks in manufacturing plants are real and should be taken seriously, but alarmist overreactions are counterproductive. Being engaged with the IIoT is not without risk, but the benefits are too compelling to forego. Appropriate precautions are worthwhile and manageable, so look for them and explore them earnestly at this show. Many buying teams at IMTS will include a person with an information technology (IT) background or responsibility. Consider this, though: Anyone at IMTS with a smartphone or tablet is in IT.